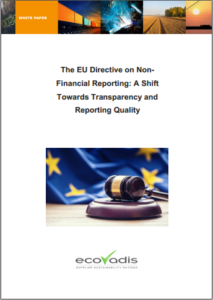 In October 2014, the European Commission passed the NFR (Non-Financial Reporting) directive. The legislation introduced new corporate transparency requirements for large publicly listed companies—considered public interest entities—in 28 EU countries. EU member states are already working to integrate the Directive’s provisions into national law, with the first company disclosures expected in 2018. This means companies will have to begin collecting data in 2017.